Just a short walk away from Richmond City Centre is one of the best new developments in this growing city. 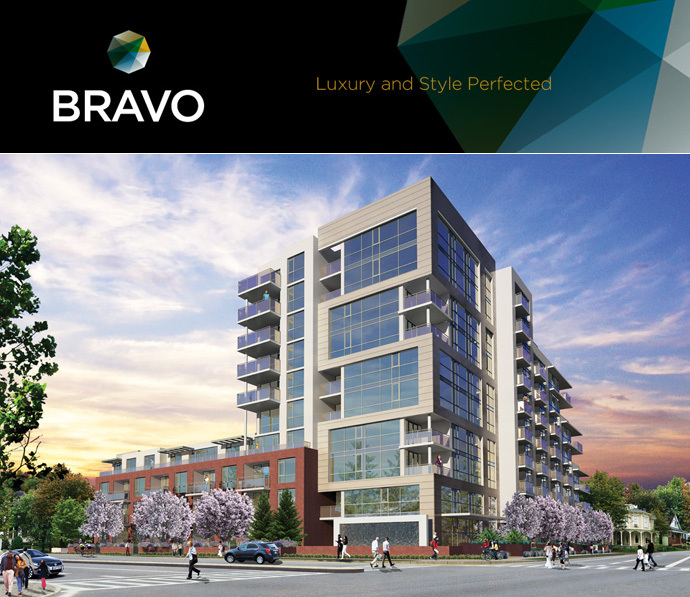 The new BRAVO Richmond Condos in BC will feature high-end residences that are located in a truly walkable and pedestrian friendly neighbourhood. You will find a serene urban oasis amongst a vibrant and exciting neighbourhood full of downtown amenities, services, shops and world cuisine. The coveted collection of new Richmond BRAVO condos for sale are just steps away from Downtown Richmond City Centre which makes it very appealing for those who want luxury and style at an affordable cost. The Richmond BRAVO Condos for sale are ideally situated away from the congestion and noise but within walking distance to everything you need to see and do in the city centre. Just a few blocks away from the new BRAVO Richmond BC condo development is Richmond Centre, Minoru Park, Brighouse Park, Garden City Community Park, Lansdowne Mall, banks, recreation centres and No 3. Road. Even their marketing at the BRAVO Richmond BC condos reads: luxury and style perfected. And so they have! The award winning development team that presents the new downtown Richmond BRAVO condo mid-rise boutique residences includes: ATI Investment Ltd with over 20 years of development, project management and building experience in Richmond and Vancouver as well as ITC Construction Group who acts as the General Contractor for this project. In addition, the preconstruction Richmond BRAVO condos will be designed by W.T. Leung Architects Inc who incorporates a truly modern, West Coast design that is timeless and beautiful. There is an elegant water feature at the building’s entrance as well as a rooftop garden that is serene and lushly landscaped. The interior design for the new BRAVO Richmond City Centre condos is by Trepp Design Inc, winner of many design awards. You can visit www.bravoliving.ca for the latest details OR, if you are NOT represented by a realtor (real estate agent) and would like representation, please register with us for the latest VIP info and details about the upcoming previews and launch. The BRAVO presentation centre is opening Mid-April 2012. BRAVO by ATI Investment Ltd is one of the top developments in our opinion. There are many reasons for this, and one of them are the high-end standard interiors at the presale Richmond BC condos. The BRAVO Richmond condos will feature five star bathrooms that include modern under mount sinks, designer Grohe fixtures throughout all bathrooms, elegant large format porcelain tiled floors and surrounds in addition to ceramic tiled surrounds in the shower and tub. Other bathroom features at the presale Richmond BRAVO condos for sale include the glass shower enclosures (full height) as well as the deep soaker tubs in select homes. There is also elegant and traditional marble counter tops as well as marble back splashes which is very unique and high-end. The five star kitchen features at the presale Richmond BC condos at BRAVO Living includes an amazing stainless steel high-end set of appliances that will include a Panasonic fully integrated microwave, a Faber slide out range hood fan, an AEG oven (electric and self cleaning feature), an AEG cook top (gas) and a fridge with bottom freezer by high-end appliance maker Fisher & Paykel from New Zealand. Also, the presale Richmond BRAVO condos will feature a Blomberg full integrated dish washer. Other kitchen features include stainless steel under mount sink with garburator (also known as in sink disposal nowadays) as well as Grohe faucet, wood veneer cabinets throughout and glossy glass tiled backsplashes. The kitchen countertops are natural (treated) granite stone. The living spaces at the new presale Richmond BRAVO condos will introduce pre wiring for a security alarm system, oversized outdoor living in all floor plans as well as rich carpets in the bedrooms. The other main living spaces have modern hardwood (engineered) floors and there are Blomberg washer and dryer from Germany. > BRAVO Penthouse & Sub-Penthouse floor plans are 3 Bedroom units. Pricing is available upon request. Also, please note that the early bird pricing is subject to HST (i.e. does NOT include HST). An initial deposit of $20,000 (bank draft) is required for you to secure your new Richmond BRAVO condo for sale with the 1st deposit of 10% (less the initial deposit) at the 7th day after Acceptance. Another deposit of 5% is due at 6 months after Acceptance for your BRAVO Richmond condo purchase. The luxury Richmond BRAVO Penthouse suites will have an even higher level of finishing standard in every boutique home. The penthouses at BRAVO Richmond BC will come standard with central air conditioning and heating as well as fully integrated Miele dishwasher and fridge/freezer. There is also a full integrated Miele master chef stainless steel speed oven with microwave in every luxury Richmond BRAVO penthouse unit. Other features only featured in the Penthouses at BRAVO Richmond includes a Miele Master Chef wall oven and gas cooktop both in stainless steel finish. Please note that all floor plan sizes are approximate and the developer reserves the right to change any layouts and dimensions at any time. Please consult with your agent and the disclosure statement for more details. In addition, the above Richmond BRAVO floor plans do not cover all of the availability at this great project. All homes will include in suite laundry. 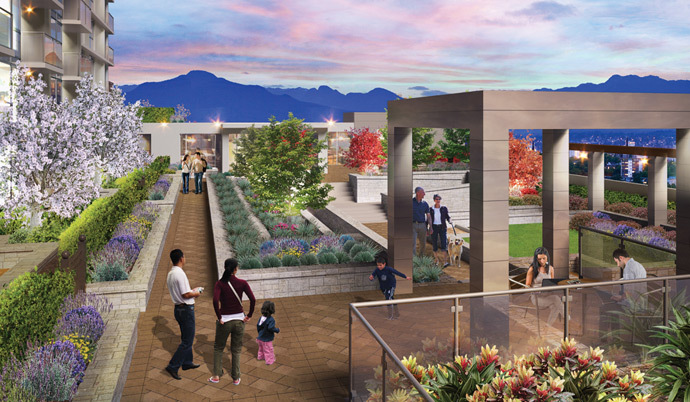 Luxury and style are perfected in this new downtown Richmond BC real estate development. Named BRAVO Richmond condos, these new residences are centrally located at Westminster Highway and Cooney Road. Coming to the market in late Spring 2012, the boutique Richmond Bravo condos will feature only 80 luxury homes in the downtown core just a couple of blocks away from the Brighouse Canada SkyTrain Line Station. Located in a quiet enclave that is away from all the hustle and bustle of the city noise, the new preconstruction Richmond BC Bravo condos will also offer a great WalkScore, as numerous services, stores, shops, dining and entertainment options are just a short walk away from your new home. In addition, the boutique Richmond Bravo Condos will feature high end finishes and features s well as a stylish exterior façade the makes for a great combination for long term property value.